The need for the emergence of new online casino sites on the market is obvious and unrivaled, because this is the most important factor in the growing demand of players in the gambling industry. However, unfortunately, not every such casino can offer its customers a service that will meet their needs and the latest trends in technology development, even though all this can greatly improve and simplify the user interface. 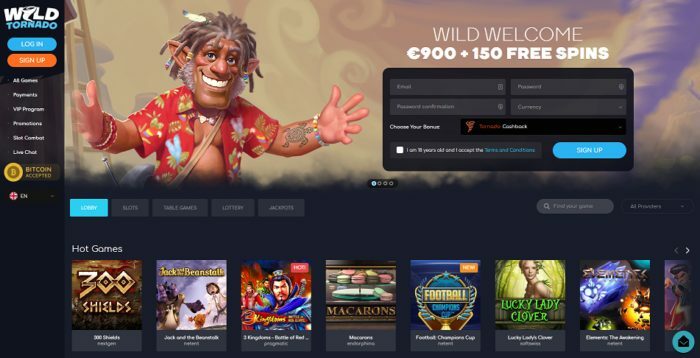 Casino Wild Tornado is new to the market, but it has everything you need to win recognition from fans playing casino games in bitcoins and real currency. The platform is managed by the Direx N.V. campaign, which can be known to many thanks to their cooperation with other online casinos, such as Oshi, BitStarz and KingBilly. The founders of the casino did a great job, carefully analyzing the market and its requests, so that the polished brand Wild Tornado really had one of the most interesting and profitable offers.